Niklas Moisander & Co. will face Dortmund on Tuesday. (Photo: nordphoto). This cup game will excite the whole of Germany. On Tuesday evening (05/02, 20:45 CET) SV Werder will face Borussia Dortmund away in the last 16 of the DFB-Pokal. 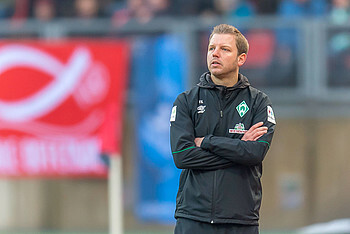 The match is part of an important week for Werder. On Monday the Green-Whites celebrated their 120th birthday. Werder will have the chance to give themselves a present in Dortmund and will be hoping to repeat their win their ten years ago. The last game: The two sides met in the last 16 of the cup in 2008/09. Thomas Schaaf’s side won 2-1, despite going behind to an early Alexander Frei goal. SVW fought back but couldn’t find an equaliser before the break. Hugo Almeida equalised before both teams pushed hard for a winner. Werder were that side as Claudio Pizarro scored the winner in the 80th minute to book their place in the quarter-finals. The run carried on that season as Werder won their sixth DFB-Pokal title. A repeat would be nice this year! Florian Kohfeldt: "We want to win in Dortmund.“ (Photo: nordphoto). The head coach on the game: Florian Kohfeldt doesn’t have much time to prepare his team for the game after the Bundesliga fixture in Nürnberg. Nevertheless, he is aware of how tough a challenge the game will be. “They have a great league record and are so good going forward,” commented Kohfeldt. Both their previous cup games this season have been “very tight and exciting” though. Kohfeldt thinks one opportunity will be when “BVB allow their opponents to have possession”. Both teams played out a tight game on Matchday 15 earlier this season. (Photo: nordphoto). The opposition: There are definitely weaker teams left in the DFB-Pokal than BVB, who are arguably the best side around right now. They have a seven point lead over Borussia Mönchengladbach at the top of Bundesliga and have the best attack in the league with 51 goals to their name. 17 players have also scored for them, showing how variable they are. Lucien Favre has brought back a fast attacking style of football to the club, whereby they look to quickly break forwards after winning possession. Despite their offensive power, they do have a weakness. Their defence can be got at and on occasion they haven’t seen out games when they have gone ahead. They will still be the clear favourites on Tuesday night, but the DFB-Pokal has its own scripts. The refeeres: Dr. Felix Brych will officiate Tuesday’s clash. The 44-year-old lawyer will be assisted by Mark Borsch and Stefan Lupp.